In 2015 the cemetery association was pleasantly surprised with an offer to fund the repairs of these three gravestones. 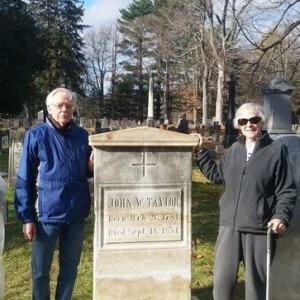 Ed and Ellie Fernau have lived in the house that John W. Taylor built for over 40 years and were quite disappointed at the state of disrepair of the Taylor gravestones. John W.’s stone had broken at least twice and was merely planted further in the ground to a point that only his name was visible. John W. Taylor was a lawyer in the village who served in the NY State Assembly then served for 20 years as a US Congressman (1813-1833). He was elected Speaker of the House for two of his ten terms, the only New Yorker to have ever held that powerful position in congress. John W. was very instrumental in helping to craft the Missouri Compromise which banned slavery north of the Mason-Dixon Line. Thank you again to Ed and Ellie Fernau ! !